It’s been awhile since I posted. Sorry folks. Been working really hard getting back in shape and changed directions at home with our goals in homeschooling (speaking of which, will be a great post later this week!). My workout goals got pushed way back to the burner. Hang with me to the end of this post to see how I got my groove back. Today I will focus on part two of a three-part series on the new Shaklee180 app. If you missed, Part 1, click here. Last time, I summed up why this app is a must have. It is free and it rewards you every step of the way for managing your health! What can you expect from this app after purchasing the corresponding Turnaround or Shaklee 180 Starter Kit? The first thing I noticed was the sleek, but simple dashboard design upon logging in. 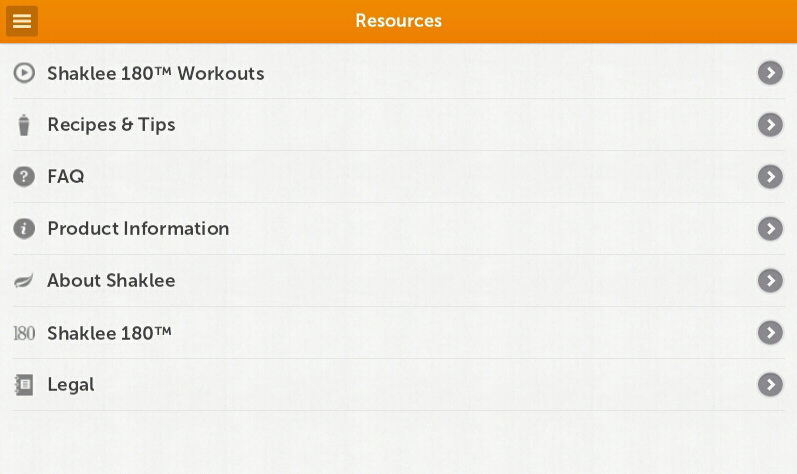 First, you are greeted and guided to input your name, goal, current and ideal weights. You can even put a picture you would like to use as your “before” picture. I don’t know about you, but I was not so worried about my before picture, but I can’t wait to see what my after-after picture looks like! One feature I absolutely LOVED because I am a very goal-oriented person, was the ability to put a picture of my choice in the “My Goal” view. For me, I quickly found a picture of my two children to be “My Goal” photo. It has worked too! When I see the picture of my kids set behind the number of days left I have to achieve my goal, it totally motivates me to go ahead with my workout rather than making an excuse. 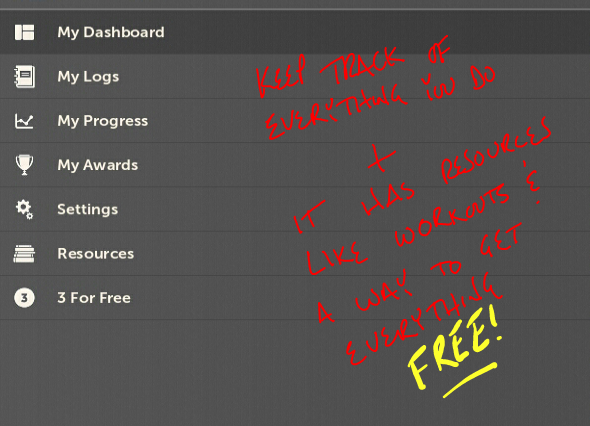 The app is divided into 7 different areas that will keep track of everything for you (picture below): Logs, Dashboard, Progress, Awards, Profile & Goals, Resources, and 3 For Free. Today I will focus on the exercise portion and next week I will go into the food component of the program. After setting up your information, you are given an entry to win a prize for the week and are offered an additional prize entry for sharing your goal with your friends on facebook. I thought this usage of social accountability was smart. It does make sense that telling friends about your goal is another motivator for finishing what was started. Are you still with me? Good! My goal for this blog was to share with people how my life really is. I want to make sure I am honest with whatever I share. I never want to appear like I have it all together (I don’t). I need help! (Especially with exercising.) I hate exercising. I don’t just hate it, but I haven’t done it in nearly four years. Yes, my health has been great nutritionally… but in terms of my endurance in a workout? Not so much. Ever since my daughter was born she has constantly interrupted my workouts or I’ve never found the time. Why couldn’t I make the time? Really, I guess I could have. But I was lazy. I had to turn on the T.V. and find the DVD or Wii game I wanted to workout to. This could take 15 minutes in itself and by then my daughter could have discovered something new to interrupt my workout with. Oh! There it went! Any last bit of determination I had. and then began by watching the 3 exercise videos. Each video alternates with 20 second bursts to 20 second rests and then rests for one minute. My kids had such a great time laughing at me and having great fun. My daughter was watching how to do it and even joined in! The music was great and the moves were easy to do. Most of all, I loved that fact that my good friends from Tennessee, Jenni and Nathan Oates, are leading my workout! Even though they were not in the room with me, I felt encouraged and not overwhelmed by their instruction. How did I feel afterward? Great! The rest of the day I had a spring in my step but I could also feel a burn in my shoulders. I am looking forward to my next workout! No two workouts are the same. New muscles are worked in every session and new music to keep you inspired. It was awesome folks! But the most awesome part was after I was done, and realized I had just worked out in my SON’S room, WITHOUT a T.V., WITHOUT the 15 minutes of preparing for a workout. I did not even have the mindset to workout or the time to make an excuse. I just turned the app on and chose the workout and DID it. Then I logged it for more rewards!